We are as one; what affects one of us, affects the other, so we consider this our journey with multiple myeloma. This is a trip we would have preferred not to take! Daily information and updates about latest research and therapy news. Debate about when (if at all) it is best to consider a stem cell transplant. Links to helpful resources for myeloma patients and caregivers. 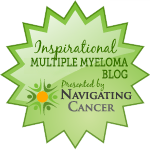 A journal of how I am dealing with Multiple Myeloma from the time I found out I had cancer. social networking for cancer survivors and caregivers. I have been diagnosed with cancer. It is a very aggressive form of Multiple Myeloma, called Plasma Cell Leukemia. This blog will serve as my own journal, chronicling my thoughts, feelings and experiences as I fight for my life. Please feel free to comment or share with others, if you feel so inclined. This is a blog I started long ago. I didn't do very much with it for quite awhile, but have recently started writing about our experiences... in part because it helps me... in part with the hope that it might help someone else. This is where I will be keeping a journal to share. Life as the wife to Multiple Myeloma patient.